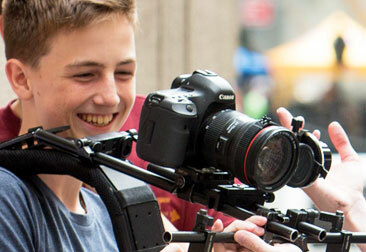 With smartphones, tablets, and software exposing kids to the tools of filmmaking at younger and younger ages, the New York Film Academy’s award-winning camps are structured to help introduce kids to the essentials of filmmaking while creating a fun and supportive environment in which they can pursue their passion. Our camps challenge young people to bring a story to life with moving images. No prior experience is required — only enthusiasm. From the first day of camp, students work hands-on with industry-standard digital cameras to learn the fundamentals of directing films. Our film camps for kids aged 10-13 are offered in one-week, two-week, and weekend modules. Filmmaking II camps are available for returning students interested in continuing and deepening their filmmaking studies. Kids enrolled in our film camps are exposed to the many different aspects of filmmaking to help them to become well-rounded filmmakers. Hands-on classes in directing, writing, editing, cinematography, and production demonstrate both the creative and technical demands of filmmaking. Each student writes, directs, and edits two short films over the two weeks. In addition to working on their own films, students also work on their fellow campers’ films in a variety of positions that include camera operator, gaffer, and grip. Students shoot on digital video cameras and learn how to compose, direct, and light for quality images and edit using digital editing software. For many students, NYFA filmmaking camp is the first time that they get to work with industry-standard film equipment, which is what many graduates of our camps cite as one of the most exciting aspects. At the Los Angeles location, students may shoot their productions on the Universal Studios backlot, a once-in-a-lifetime opportunity to shoot on professional sets that have appeared in countless movies and television shows. At the NYC campus in Battery Park, campers may go outside and use downtown Manhattan as a backdrop while chaperoned by instructors and supervisors. At the NYFA South Beach, Miami campus, students may use vibrant Miami as the backdrop for their films. Upon successful completion of camp, final films are celebrated in a screening open to cast, crew, friends, and family. Designed expressly for graduates of the Film Academy’s filmmaking camps for kids, our filmmaking II camps offer students the opportunity to take the next creative and technical steps in filmmaking. Students develop, pre-produce, and create a longer and more complex project. Closer attention is paid to set and costume design, locations, shot choices, and coverage, as well as additional crew roles. Advanced students are also introduced to Green Screen Equipment and basics in special effects. Classes focus on topics including digital cinematography, screenwriting, editing practice and aesthetics, and directing for cinema, all building on the skills establishing in the Filmmaking Camp. The finished product is a film of up to five minutes. Graduates of our filmmaking II camps often go on to shoot their own films and seek further instruction in our teen filmmaking camps as they come of age. Curious to learn more? Click here to request information and apply online today. *There is no dormitory housing available for the Kids Film and Acting Camps. Therefore, we only accept students who have made prior arrangements with family or friends.